Solid, cylindrical branches covered with many distinctive small spinelike branches, branched sparingly to repeatedly. Grows to 20 cm high. Color varies from red, brown to dark green but turns yellow in bright sunlight. Hawai‘i: Well established on all islands: Hawai‘i Island, Maui, Moloka‘i, Lana‘i, Kaho‘olawe, O‘ahu, and Kaua‘i. Worldwide: Prickly Seaweed has a nearly continuous distribution in all the tropical and subtropical seas of the world. Mechanism of Introduction: Unintentional introduction possibly by barge from Guam in the 1950’s. Prickly Seaweed with long branches in calm water. Prickly Seaweed (Acanthophora spicifera) is abundant on calm, shallow reef flats, tidepools, and on rocky intertidal benches. This alga usually attaches to hard substrates, such as rocks, basalt ledges, or dead coral heads. Prickly Seaweed’s branches are easily fragmented, which contributes to frequent, large free-floating populations and its widespread distribution. Prickly Seaweed was accidentally introduced in the 1950’s and since then has become the most widespread alien alga in Hawai‘i. 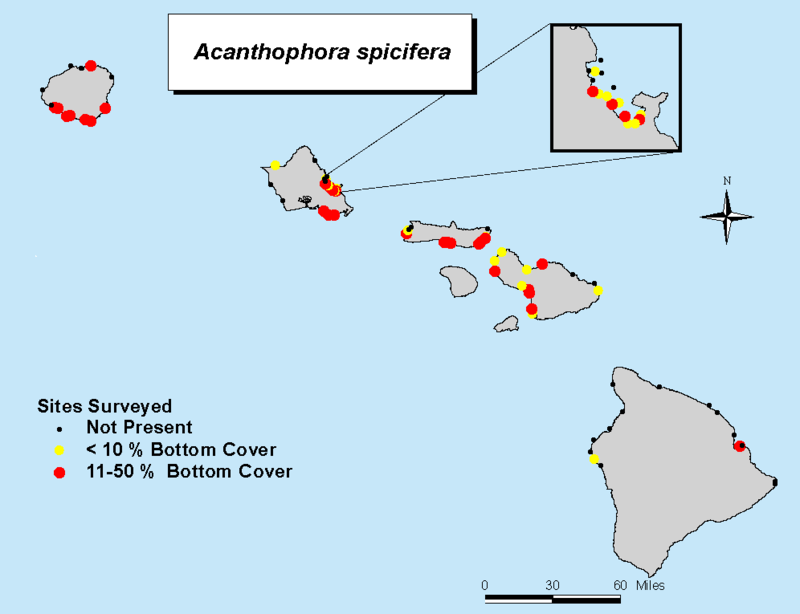 It is now found on all of the main Hawaiian Islands and is a common component of the intertidal environment throughout the state. Fine hairs on the branches trap sediments, which, in areas with high sedimentation, can be detrimental to water quality. Prickly Seaweed is highly adaptable: it is found in brackish ponds, on calm, shallow reef flats, in tide pools and on rocky intertidal benches. It is also tolerant of changes in salinity, high wave exposure, and exposure to air. Prickly Seaweed is often found with native and other alien intertidal species, such as Laurencia (Limu Mane‘one‘o) and the alien Hookweed. This alga’s plastic morphology has allowed it to adapt to different conditions and invade a diversity of habitats thus displacing many native species that grow in the same habitats.